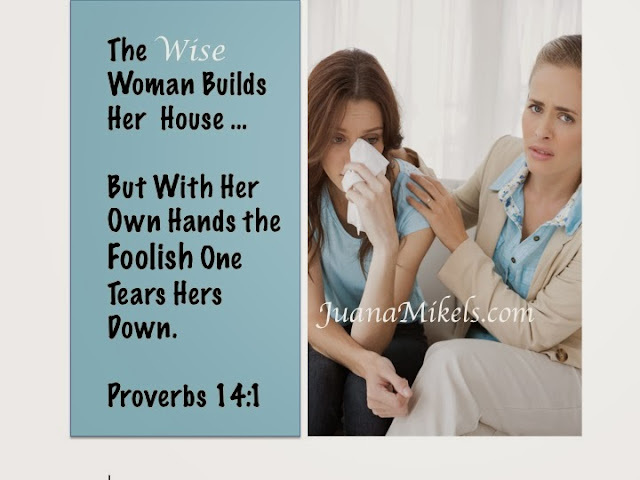 JuanaMikels.com: Link to Hear My Testimony Today at Bentwinds & Wednesday's Prayer Girls and Link-Up Party! Link to Hear My Testimony Today at Bentwinds & Wednesday's Prayer Girls and Link-Up Party! I was that foolish woman—as you are about to hear. Below is a link of the talk I gave today to the women of Priority Associates in Fuquay-Varina, North Carolina. We laughed together and we cried together! I tell how I came to faith in Christ, how He saved my marriage, and how He provided His grace to us in the birth of our 4th child who was born totally blind (running time: 53 minutes, which includes a 2 minute introduction by Teresa Parker Hamby). If you're reading this on your smartphone, you can click the above link and listen on your phone if you prefer to drive or walk with earphones and listen. ☺ You can also cut and paste the above link and email it to someone else. 1. Man's part is to trust, and God's part is to work. 2. Receive everything in your life as directly from God's hand. Wednesday's Prayer Girls and the Link-Up Party! Can't wait to hear what's been on your heart! If you are a Christian blogger, we'd love to read what you've been writing, so link-up below! If you have a non-confidential prayer request, or praise to share, please put it in the blog comments below, and I will reply back to you there! Thank you as usual for your faithfulness to us every week. Continued prayers for HS classmate, Wayne, as he battles stage 4 cancer. Oh, I forgot a big praise for my son's 21st Birthday yesterday! A big HAPPY BIRTHDAY to you son, Jana! Loving Lord, We praise you for then life of Jana's son. May you continue to grow Him in favor with You and in favor with man. We lift up Wayne to You. May you touch his body and also allow him to grow spiritually through this storm. May he trust his days to You, Lord. Deepen his faith in You with each passing day. Amen.